The Allegheny Mountain Dusky Salamander is a medium-sized salamander specie from Canada that grows up to 10cm. Adults are brown and have widely variable coloration patterns. Usually, it wear a light stripe down the back, with a row of dark spots on the centre and dark pigments on the flank. 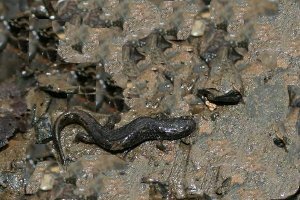 Allegheny mountain dusky salamanders are found in USA and Canada where it’s present only in two localities in Quebec and population of this salamander have been recently discovered on the escarpment of the Niagara Gorge in Ontario. As all members of the genus, the back pair of legs are larger and stouter than the front legs. This species belongs to the Plethodontidae, the lungless salamande family and it is vital for adults secimens to keep their skin moist in order to breathe. It is a somewhat terrestrial salamander that can be found under stones, logs, and bark near springs, swamp and streams where the ground and vegetation saturated with water. Allegheny moutain dusky salamander is considered a endangered specie by the 2007 Endangered Species act in the Province of Ontario and is facing severe threats since it is at the edge of it’s distribution range in Ontario and is population are quite small and isolated. This rarety and the proximity of human activity and pollution of the habitat are causing a decline in Allegheny Mountain Dusky Salamander population and it’s cousin the Northern Dusky Salamander..